Always elegant. Always send an impressive message across. 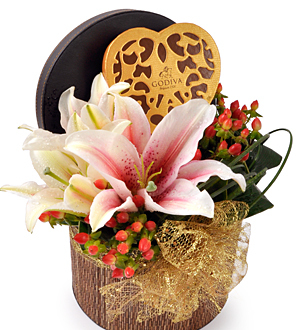 A box of Godiva Heart Shaped Gold Collection 6pcs presented with an arrangement of Stargazers and Berries. All Godiva Chocolate packages are available for delivery within Klang Valley only. For other States, kindly provide at least 3 working days notice. Otherwise, other chocolates may be used to substitute Godiva. Call our Customer Service at +603-78830233 / +6012-6915200 or sales@gift-lab.com for enquiries.